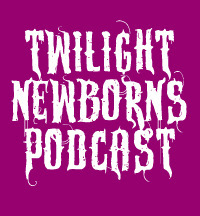 TwilightNewborns.com is a fansite and podcast about the Twilight series written by Stephenie Meyer. Christen is a pop-culture aficionado and hamster tamer. She dreams frequently about Edward Cullen. She is ready for the Zombie Apocalypse and thinks you should be too. She recently received her graduate degree and uses the Twilight Series to cope with the trauma. Christen lives in Cincinnati, Ohio. Melissa is a recovering Harry Potter fan and makes quick reference to that series on the Twilight Newborns podcast when Christen gets out of line. She often carries a Pocket Edward in her bag “just in case.” She has a graduate degree and is still dealing with the nightmares. Melissa lives in Cincinnati, Ohio. Dejeuner is the podcasting mascot of the Twilight Newborns. A stuffed animal mountain goat, he takes his name from the French word, meaning “lunch.” He is Team Robert and would love to start a bromance with the man. Dej lives in Cincinnati, Ohio. We have several ways you can contact us. Subscribe to our podcast through iTunes, Blubrry, Podcast Alley. 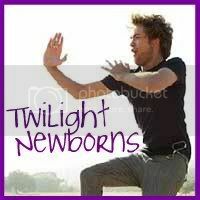 Follow us on Twitter at twitter.com/twilightnewborn. TwilightNewborns.com has no official affiliation with the author, publisher or film companies involved in publishing or production the Twilight series nor do we have any affiliation with their associates. For feedback or questions, you can contact us at twilightnewborns AT gmail dot com. You can also leave us a comment on our voicemail to play on our podcast at (513) 252-2895 (United States). Be sure to say your name, location and comment.